Rating: 7.1/10. From 11 votes. Summary: The description, specs, pricing and photos for the Cabot Guns South Paw pistol. 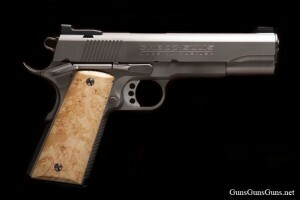 The Cabot Guns South Paw is a true left-handed 1911 semiauto pistol. Cabot says it’s the only truly inverted pistol on the market. Chambered in .45 ACP and built on a 4140 billet steel frame with a 4140 billet steel slide, the South Paw sports a gray nitride finish. Available grips include California olive wood, box elder and locally-harvested walnut, which is milled on the Jones family farm located behind the shop where Cabot Guns are produced. The South Paw features a front sight called the Rozic blind sight. Rather than staked from the top of the slide, the sight is dovetailed from the from the front of the barrel providing seamless integration into the slide. The sights are available with white dot, tritium or gold dot. Cabot will produce 100 South Paws for 2012. .45 ACP 8+1 5″ n/a n/a 40 oz. Order this gun through Cabot, or its dealers. 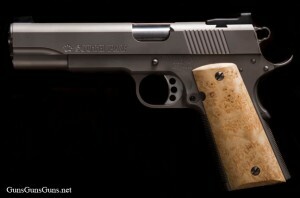 This entry was posted in .45 ACP, $5,001-$5,500, 1911, Cabot Guns, Full size, Semiauto on February 10, 2012 by Staff.